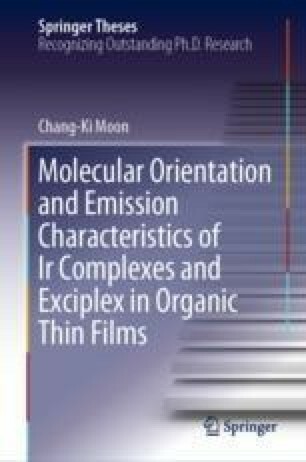 Molecular orientation in organic semiconductor is an important factor influencing electrical and optical properties . In OLEDs, emitting dipole orientation (EDO) is directly related to the outcoupling efficiency of the light. Therefore, employing horizontally oriented emitter is one of the effective methods to enhancing the outcoupling efficiency of OLEDs [2, 3, 4, 5, 6, 7, 8, 9, 10, 11, 12, 13]. Recent researches have focused on molecular structure of emitters [5, 8, 10, 12, 13] or changing deposition temperature to understand the preferred EDO of emitters doped in host layers [14, 15].